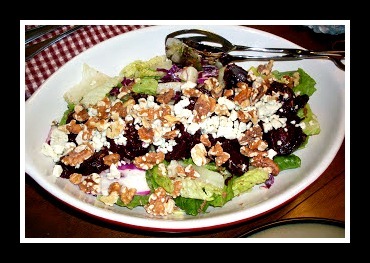 Roasted Beets, Blue Cheese and Walnut Salad over mixed greens. vinaigrette of choice, this one would be delicious! Place beets in a baking dish, roast at 350 degrees for 1-1 1/4 hours or until pierced easily with the tip of a knife. Set aside and let cool. Remove the skin, this is easily done by pushing gently against the beet until the skin begins to "slip". Slice and set aside. Toss the salad greens with vinaigrette, layer in the bottom of a shallow serving dish. Toss beet slices with additional vinaigrette, layer over salad greens. Add blue cheese and finally top with walnuts. What a glorious salad, Melynda--I have everything to make it, so this is a good reminder to get on it! I just love Roasted Beets and this salad would be awesome. Hope you have a great holiday weekend and thank you so much for sharing with Full Plate Thursday. What a gorgeous seasonal salad. i love the combination of the beets, walnuts and cheese!